Any responsible parent should be aware that many games on the market contain an excessive degree of violence. The Grand Theft Auto and Call of Duty series are renowned for their innovative and imaginative gameplay, but they are also equally notorious for the degree of violence they contained. Although there will always be an ongoing debate surrounding the moral question of such violence in games, there is no question that age restrictions should be put in place to prevent children from being exposed to potentially upsetting material. The Entertainment Software Rating Board (ESRB) has developed a video game ratings system which has been widely adopted by game publishers and retailers as the most tried and tested system of its kind in the US. It allows parents to make informed choices about the age-appropriateness and suitability of video games and apps through a universal rating system based on child development, impartial information, and parental concern. The board is a nonprofit, self-regulatory body that holds the video game industry accountable for its marketing methods. It administers a three-part video game ratings system, which includes age-appropriateness, content descriptors, and interactive elements, which analyzes if the users’ location and personal information are shared. Additionally, the ESRB website offers in-depth and informative descriptions about the games. 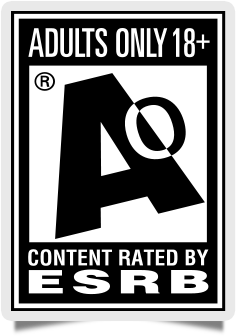 The ESRB video game ratings system, which is printed as black and white letters on the outside of a game’s packaging, are as follows: EC is for Early Childhood; E is for Everyone; E10+ is for Everyone over Ten; T is for Teen; M is for Mature (17+); A is for Adults Only; and the rarely seen RP means Rating Pending. In addition, ESRB-rated games have content descriptors on the back of the box which indicate elements such as “Intense Violence,” “Mature Sexual Themes,” and “Drug Reference,” which may have caused a particular rating. Remember, you know your own child best, so you can’t rely completely on a rating system when it comes to what games may or may not be suitable for him, but the ESRB does offer a very reliable, user-friendly and invaluable service.